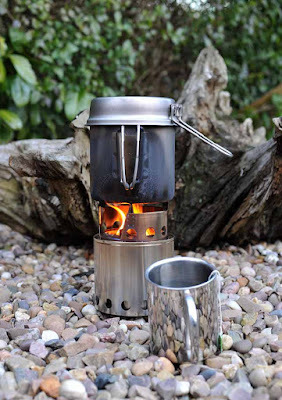 I know woodburners are currently very popular, but they are rather good! They're fun to use and free you up from having to carry fuel. 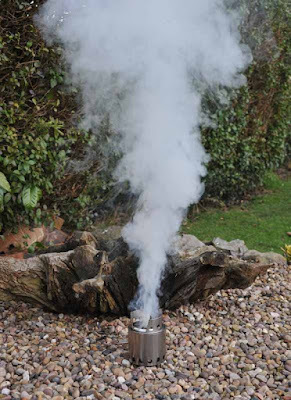 I followed a couple of outdoor blogs where different types of woodburners had been tested and reviewed. Having spent a bit of time assessing the options, I decided to order a Bushbuddy from Fritz Handel in Iskut, BC. 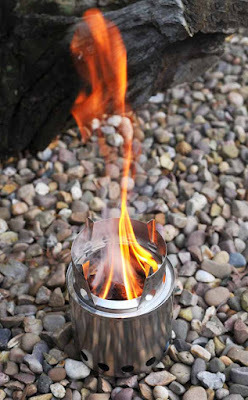 This kind of stove is ideal for my forthcoming wilderness canoe trip in Sweden in May. Last year, I had to keep a close eye on the amount of methylated spirit (denatured alcohol) that I used for cooking and making tea or coffee. In a wilderness area there are no outdoor shops around to buy more should you run out. A woodburner is the logical choice. I can take meths or burn wood if I wish and not have to worry about fuel, wood is plentiful in Sweden. Fritz Handel is a perfectionist, this is evident in his workmanship and attention to detail. The Bushbuddy is a lightweight work of art! 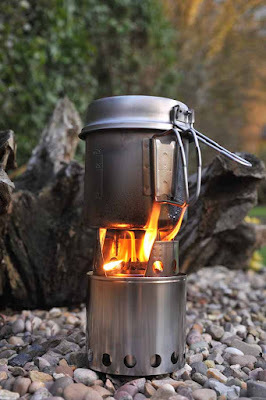 It fits perfectly inside a Snow Peak 900ti pot and a trangia burner can fit inside the Bushbuddy with room for a small firesteel. The whole package is very compact and lightweight. I won't write yet another lengthy review there are plenty elsewhere, suffice to say that the Bushbuddy works perfectly and is one of those pieces of gear that you instantly like. Fires are fun! ....flames burst into life, 'gasification' starts and the smoke vanishes. 850ml (30 fl ozs) of water. Efficient burning, only white powdery ash remains in the Bushbuddy. Black soot remains on the pot! 12 minutes to a rolling boil and two mugs of lemon & lime tea!